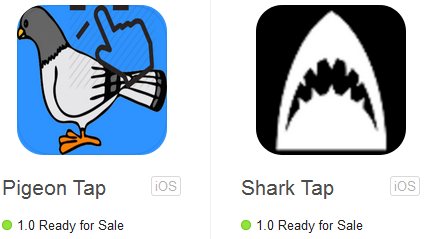 1) When I started iOS development, my first practice project was a game using the SpriteKit framework named Shark Tap. After watching a bunch of tutorials on how to create a 2D game I decided to implement once myself. I went towards making a game that was simple but challenging at the same time. The objective of Shark Tap is to tap near the swimming sharks as they come towards you at the right moment. The player is a pixelated fish which can only move up and down within the map by the sliding of a user’s finger or thumb. Throughout game play, the sharks get a lot faster and smarter. Smarter in this context means that the sharks begin to “swim” towards the fish’s direction, making it harder for the player to dodge or tap near the shark. I didn’t want to worry too much about the art of the game, so used open source images as a base for the characters. 2) My second game could be called a Flappy Bird clone. After the release of Flappy Bird, many modified clones started to appear throughout the App Store. I was always curious how it was developed due to the simplicity and the popularity it expressed, so thought it would be a fun project to implement. The difference, however, is that my game, Pigeon Tap, uses a pixelated pigeon (Another pixelated character you may be thinking? Yeah I don’t know why I must have a thing for it). The pigeon has to avoid the pipes by “flying” in between. The map consists of clouds and a ground to give the flying in the sky look. One game play difference is that unlike Flappy Bird, the pigeon does not die when it touches the ground or the top of the screen.